The Financial Times has quietly lifted the cover price of its weekday edition in the UK from £2.20 to £2.50, its second cover price rise within the past three months. The Pearson-owned business title is also raising the cover price of its Saturday edition from £2.80 to £3. The FT introduced the price rise on its weekday issue on Tuesday (January 3). The weekend edition cover price will increase from Saturday (January 7). 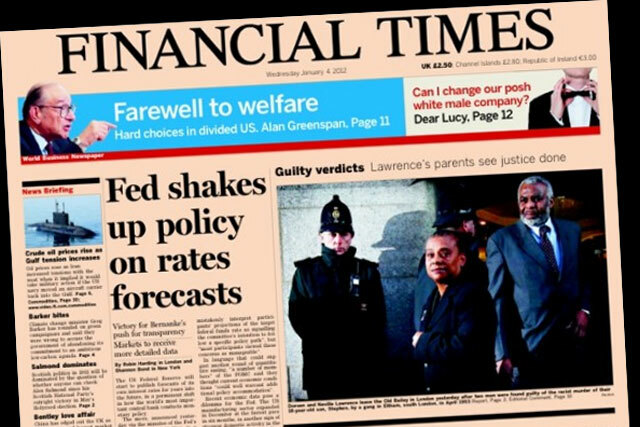 The cover price of the weekday edition of the FT was last increased in October 2011. The Financial Times justified the cover price rise, citing the "increased quality of its content" and the increased production costs of producing a newspaper. A spokesperson for the FT said: "This price rise reflects our increased distribution and production cost levels and the investment made in the quality of our content." According to the Audit Bureau of Circulations (ABCs) figures, the circulation of the Financial Times was 337,239 in November, down nearly 8,000 on the previous month, across a struggling national newspaper market. The Financial Times web-based app, which launched last year, attracted nearly 200,000 downloads in its first two-and-a-half weeks after launch.